I'm married to a scavenger of sorts and he often totes home rescued boxes of books that I paw through with shiny, hungry eyes. I pull out the odd and interesting and add them to my teetering stack. This is a page-turner! And not for the faint-hearted. Be prepared to start identifying pscyhopaths in your every day life, then feel really bad about it. 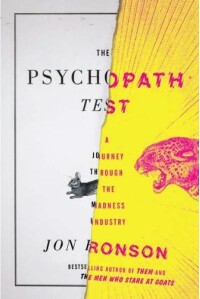 I really love Jon Ronson's writing style, even if I don't always agree with his conclusions. He has a very transparent approach to sharing his own inner journey through writing about others that I find extremely refreshing in our current paradigm of always trying to seem perfect in every way. In truth, we are all struggling in different ways and Jon celebrates that truth. A fascinating read!